This morning my 2 boys and I headed out on a road trip to try and catch a glimpse of Space Shuttle Discovery making her final flight into Dulles National Airport. she was riding piggyback on Nasa’s enormous 747. We pulled into VA and traffic was at a standstill. All parking lots were full and we thought we were done. I went 2 exits past the airport and pulled over into an industrial office complex (to let me boys use the car potty). 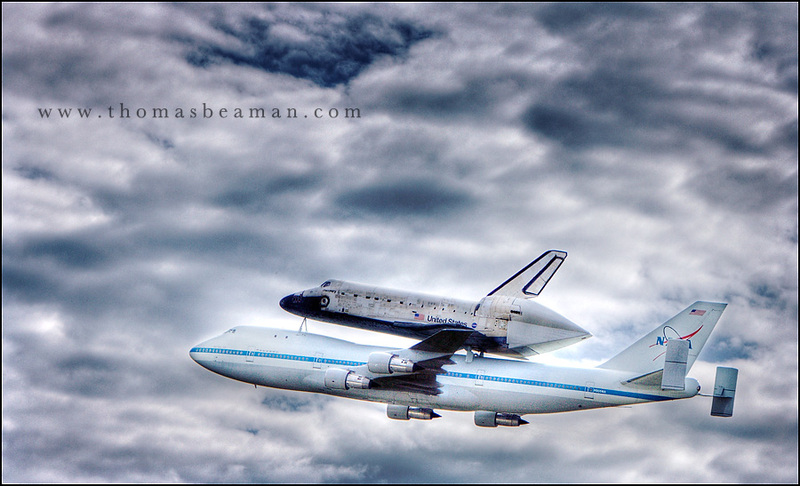 As I was getting the car potty set up, Dylan, my 4 year old, says “Hey Daddy…….look at that!” I turned around to see Discovery on approach. I grabbed my camera, dialed in my exposure in about 1 tenth of a second and snapped off a few frames. This one is being printed and going in my boys room.